Men of Distinction – George Bridgetower (1778-1860) | musings at random. 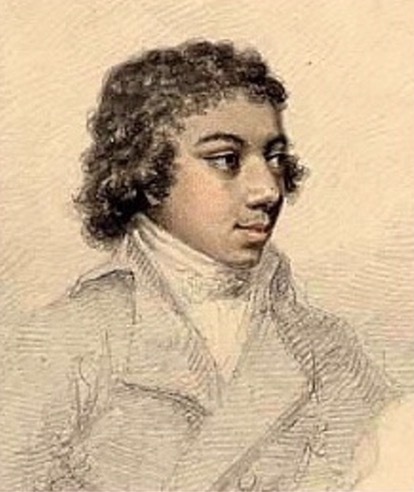 A product of mixed parentage (his father was likely from Barbados, and his mother from Germany), George Augustus Polgreen Bridgetower was born in Poland in 1778 and became one of the foremost violinists in Europe at the time, studying under esteemed tutelage, playing alongside Beethoven, and performing regularly in the famed concert halls. In his youth, he gained a favorable reputation performing in England and France, and the British Prince Regent, George IV, took him under his wing; under this assistance, he studied alongside several respected musicians and performed extensively. While in Austria, he met and played with Ludwig van Beethoven; Beethoven was so taken by his skill that he dedicated his Violin Sonata No. 9 in A major to Bridgetower. After the piece was performed for the first time, in 1803, Beethoven gratefully gifted his tuning fork to Bridgetower. The friendship was short lived, however. Bridgetower allegedly insulted a woman who happened to be Beethoven’s friend, and as a result, Beethoven severed their relations and re-dedicated his sonata, previously dedicated to Bridgetower, to violinist Rudolph Kreutzer. Kreutzer himself never played the piece, deeming it too difficult, according to contemporary accounts. Bridgetower later returned to England, married, joined the Royal Society of Musicians, attended Trinity Hall (earning his degree of Bachelor of Music), and continued to perform extensively. A talented musician unfortunately relegated to the dusty footnotes of history (his name would have been undoubtedly well remembered had Beethoven’s sonata continued under the title of Bridgetower Sonata), although his skill as a virtuoso earned him much renown in his era. Theatrical Thursday – The Killer (1989).